This is one of my favorite paintings, not because of its visual appearance but because of the joyful process of creating it. Having what I considered to be a lot of stress in my life at the time, I wanted to represent something that would exemplify how I felt. And, of course, the process did help to alleviate most of the stress altogether! The beginnings of this painting were interesting, but, at one point, I had a sort of “blah” painting that needed some spicing up. Here is a photo that shows the painting in one of its early stages. It was, at this point, coming together, but still needed some work on the right-hand side. So I continued to add color and emphasis, using a small circular stencil to add the small dots you see within the circular shapes. When completed, the edges were finished and the painting was hung on my wall. 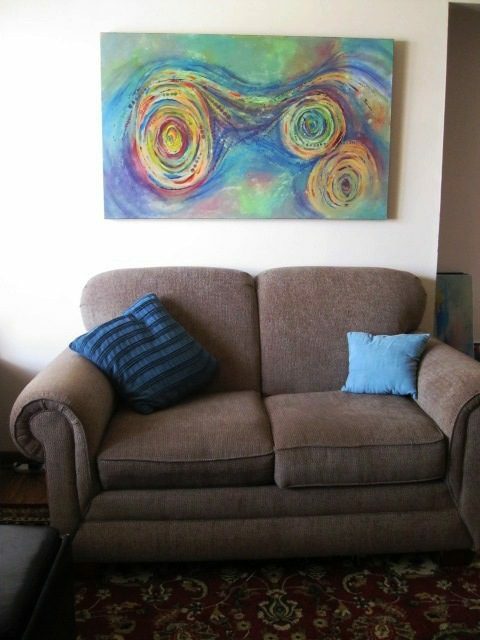 Some photos were taken to show specific areas and the overall effect when hung. Though this may not be my best work, it certainly has meaning to me. It has the impression of being wound up (stressed), much like bobbins on a sewing machine, and then being let loose – becoming less stressed. Thus, Coming Undone! Having had my blog for awhile now, I realized you might like to know a bit about me. This post, then, includes my artist’s statement and biography. My true feeling about art is that it is, as they say, “food for the soul.” Thus, my path to creating art has focused on filling that need for both me and the viewer. Ever since I can remember, I’ve loved artwork, both creating and viewing it. So I was inspired to not only create artwork, but to BE an artist. I love to share my artwork with others and hope they see something that sparks an emotion, a memory, or an idea. My artwork is created with joy and love. I strive to create expressive themes, focusing on design, line, shape, color and texture. Often music is an inspiration that helps me to exhibit emotion in the painting process. Though I do follow artistic “rules,” rules are made to be broken – within the limits of good design and what is pleasing to the eye. My goal is to create unique, interesting and eye-pleasing art that lights a fire within the viewer. Pure enjoyment is awarded to me by when I am painting emotionally and abstractly. I enjoy painting both expressionistic and impressionistic abstract artwork. Inspiration can come from the colors of a photo on a calendar, the shape of a shadow on an object, or something purely from my own mind. I never become bored with creating. Seeing my artwork giving others delight is the greatest gift I can receive. My pathway to becoming an artist began in 2009 when I became inspired to paint watercolors. Over several years, I practiced painting, studying on my own and taking a few local watercolor and mixed media workshops. 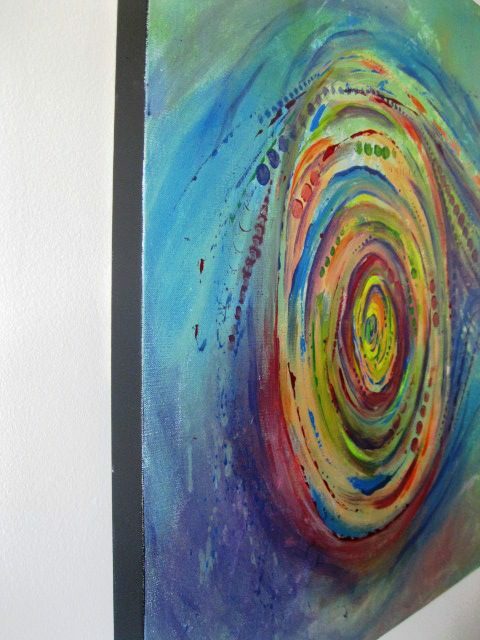 In 2015, I enrolled in a one-day Abstract Acrylic Workshop presented by Elizabeth Chapman, a nationally-known local artist. After being inspired by her work, I gave up doing watercolors and now focus on painting expressionistic and impressionistic acrylic abstracts. Recently, I have painted some small acrylic floral paintings, as well. But my main love is doing abstract artwork. In 2012, I joined Studio 55 Fine Arts Guild where I am currently Treasurer. Studio 55 sponsors several exhibits, including yearly exhibits for Studio 55 members at the Botanical Center, the Nature Center, and the Library Center. The Senior Art Exhibit at Juanita K. Hammons Hall for the Performing Arts is held annually for all senior artists in the area. Studio 55 sponsors a Fall Exhibit and Silent Auction every year, as well. I have exhibited at many of these events, including a recent Studio 55 exhibit at the Sky Gallery at the Springfield-Branson National Airport. In 2015, I was awarded second place for my painting, Jubilation, an acrylic abstract piece, at Studio 55’s Fall Exhibit and Silent Auction. My goal is to create unique, interesting and eye-pleasing art that lights a fire within the viewer. I want to give pleasure to others, as well as enjoy my own process of creating. Since the beginning of April, I have been a bit uninspired to continue my abstract painting. Although I will never give up paintings abstracts, there are times when I feel a more structured painting would help me to become more creative. So I decided to take a “break” and get myself grounded once again. The way I do this is to paint something with a more realistic approach. Since I love, love, love flowers – there aren’t many who don’t – I decided to paint some small 12×12″ florals in acrylic. First, I decided to do tulips. I remember my first trials at painting these seemingly simple flowers in watercolor several years ago. After painting “umpteen” tulips, I finally got it! So my first small acrylic is of some March Tulips. I painted these in warm colors to signify the warming of the earth as spring rolls ’round. Next, I painted my most favorite of flowers – the bearded iris. My challenge was to paint these in more or less of a straight line arrangement; thus, Iris Parade was formulated in my mind. I decided to paint them in cool colors since the first floral of tulips was in warm tones. And finally, since there are no flowers without a few weeds amongst them, I decided to paint a milk thistle. Their lovely fluffy heads and oddly shaped tendrils surrounding them intrigued me. I loved using a small brush to paint multiple layers of magenta, ultramarine blue and white to create the flower head. My foray into painting a few florals has now made me yearn to go back to working more expressively. Doing more detailed work impresses upon me how much I love putting my feeling into paintings. Now that I am “grounded” I can happily and eagerly return to creating some new abstract acrylic paintings. Starting out, I squeezed some random paint in the colors I wished to use for the painting. I chose white, turquoise, ultramarine blue and cadmium red. These were applied roughly in a pattern that I had in mind. Then I spread the paint around with a large bristle brush, letting them mix and mingle. Using a small cup, I stamped some circles into the wet paint and used a wine cork to apply and/or remove paint from various areas. I placed these circles in a more-or-less cruciform pattern to assure a nice composition. Though I wanted circles to predominate, I felt the painting might become boring if this were the only design. So I decided to use a zig-zag stencil in some areas to provide variety. Though the painting was coming along nicely, I studied it and decided it needed more definition. Lines were added in a geometric pattern across the painting using a palette knife and black and white paint. Some, but not all, of the shapes formed were painted over with a layer of paint mixed in various shades of gray. All colors used in the painting were used to mix these grays. A paper towel was used to remove paint and let the background show through in some of the areas.